This weekend course builds on skills learnt in round basketry classes, and is for improvers and advanced students. You will learn to make a stylish, tall oval shopper with a handle. A great basket for wine bottles, A4 folders or your weekly shop! 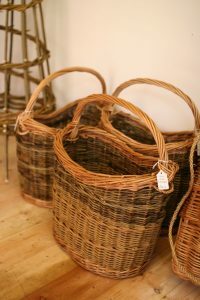 You will be using fine, high quality somerset willow and explore some of the more complex basketry techniques. Each participant will tackle their own individual project after a brief discussion of the possibilities and demonstrations by the expert. The choice is yours. This workshop is one of a series delivered by Jane Wilkinson www.specialbranchbaskets.com Jane has been teaching her craft to students all over Scotland for 18 years and enjoys sharing her skills with enthusiastic participants. Off the Rails is very well suited to basketry workshops, with space to work out of doors if the weather behaves. Spaces are limited to ensure maximum tuition and support. Cost £80 plus small charge for materials.